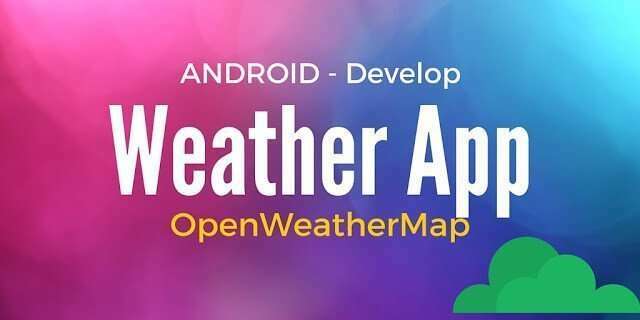 As weather provider, this Android weather app will use OpenWeatherMap a free weather service that provides some interesting API really easy to use. The final result is shown below so that you can have an idea about what we will do in this post. In the tutorial below, we assume you have the API Key and you append it to the URL. 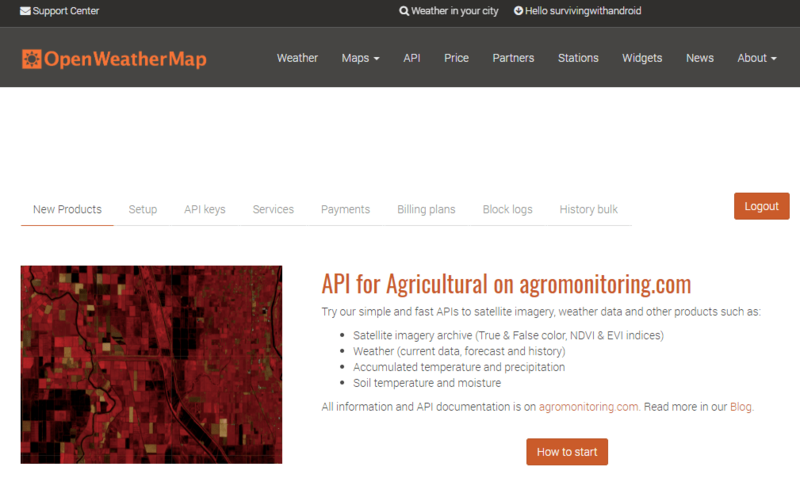 OpenWeatherMap offers several API to use to get weather information. 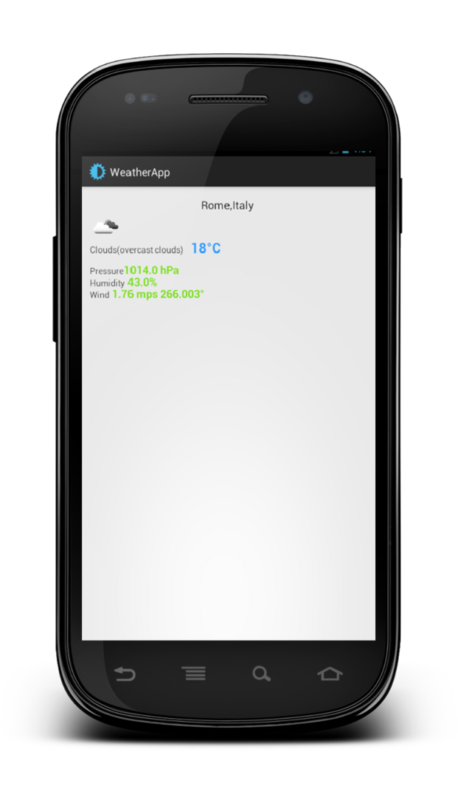 This Android weather app uses the Openweathermap API that gives us the current weather info. At the end, we have our Weather class filled with the data retrieved. Finally, it is the time for our Activity. The layout is very simple and, of course, it is just a skeleton you need to improve it if you want to have a production app. In onCreate method, we simply get the reference to the Views inside the layout so that we can populate them later after the request is completed. At line 3 we make the HTTP request and then we parse it at line 6. At line 9 we retrieve the icon that shows the weather condition. It could be interesting to integrate a physical object using IoT project with weather forecast and Arduino. 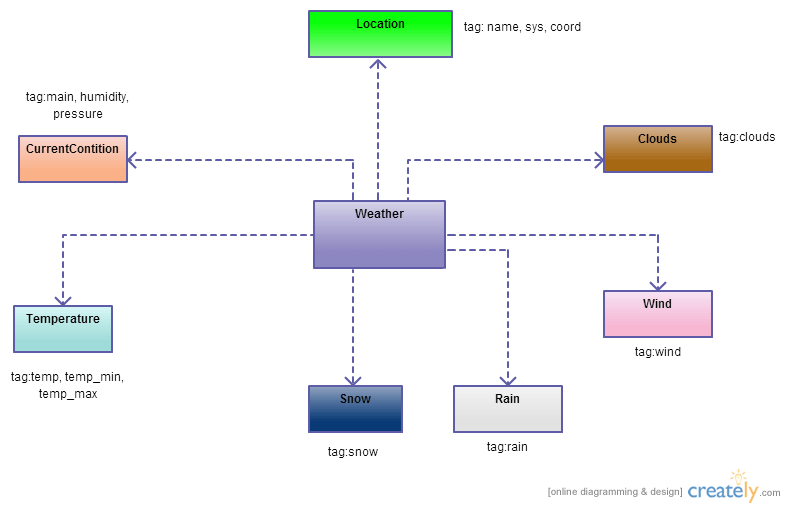 Hopefully, at the end of this post, you gained the knowledge on how to implement an Android Openweathermap app that shows the current weather information. Thank you for the great tutorials and open source code. It has been a huge help for me in learning parsing. When I enter "JSONObject coordObj = getObject("coord", jObj);" in the mainactivity I get the error: "Unhandled exception: org.json.JSON.exception". While the getObject method is also implemented and org.json.JSONException is imported. Have you tried to log the JSON response you get from the server? Is there coord obj? Thanks, great tutorial! Could you tell me how to use the forecast feature as well? For example displaying the 5 day forecast? Do you have any video tutorial for this?? I'm planning to write a post about next days forecast. Many people are asking for it. thank you, that would be amazing! Any eta? Awesome job. How would you change the location though? I'm trying to make a weather app so I want to be able to change the location using the gps. Thanks in advance. This tutorial is very helpful, but one problem I have is the weather icon doesn't show up. In the onPostExecute() method the if statement never runs. Do you have any idea why that's happening? As far as i know, there are some weather code that doesn't have an icon. You should map weather code with your icon weather set. I'm using your code exactly and it works great but icons don't show up. I can see the icons in your screenshots, can you give us the code you use? Hi, this is a great example, thanks for this. setDoInput means that the app wants to use the connection as input, so it wants to read data. AFAIK the default value is true so if you remove it i guess the result doesn't change. setDoOutput means the app wants to write to the connection. The default value is false. In my experience this two parameters doesn't affect the icon download. If you look at my app in the app store it download icons correctly. Anyway i guess the problem happens when there's some weather code that doesn't match an icon. Let me know if you have an example that helps me. when I type this url in the browser I am able to see the weather icon but in the android emulator this fails. Any idea? This is not full example…………..
somebody can hellp me and tell me how to do it? what is the name of class for each of the codes??? What do u want to know? The weather codes? how to download the icon ?? How can I use my own icons and refresh data?, thanks in advance, great tutorial, you are a great help. You should try first to use the link u get in getIcon in your browser and check if the icon is shown. You can create a map between the weather code condition and a resource id related to the icon you want to show. I can't load icon too. I tried to load getIcon in to string, but App is crashed. How can I change the condition language?, or call condition text from strings.xml? I can't load too, and app is crashed, when i haven't Internet connection, what i must to do? What types of weather conditions returns the API? Clouds, broken clouds, light rain, etc.. Anyone knows why my location is always London instead Vicenza (Italy)? I tried to download the source and run the apk but always returns that i am in London.. Doesn't recognize the geolocation? for that it loads by default London weather condition. Hope it helps you. Ah ok.. because i really need the code with geolocation and i can't find anything on the web.. I need very little informations like only : condition and temperature nothing more. Of course using location. But actually i can't do it. Can i contact you via hangout? -> here I put the icon reference with if statement, am I right? I am hoping you can help, I get some user crashes on 4.4.2 on a few devices. Hoping you could point me in the right direction. "message" and "gust" are not part of you tutorial, but I do not get a crash on my devices even they return this. I am not familair with parse outside of your tutorial. At line 44 where you get the error in my code there's a comment in the code so can you send me the line where u get the error? Otherwise have u checked the new weather lib i developed at github? (https://github.com/survivingwithandroid/WeatherLib). It is ready to use lib and you can integrate it in your code easily. I had a longer first post, (above is second) which I provided more detail, I assume you read and deleted it? Thanks for the quick response. I tried to get the current weather condition for your city, using 4.4.2 as you suggested. Remove the con.setDoOutput(true); statement in getImage(). Not sure exactly why, but it does to trick. If you don't want to use the standard icons provided by openweathermap you can load you resources, otherwise you can download them from remote server. I suggest to you to join https://plus.google.com/communities/117946761543584564970 my community where we can talk about it and i've developed a new ready-to-use lib that helps you in several aspects while developing a weather app. Thank you very much, I look to the community. I seem to be a bit late to the party but when I run the source code (from github) the app stops working immediately.. Any ideas? What is “data”???? where do you get it from? What is "data"???? where do you get it from? I get thw same error. How did you fix it? Can you check if the URL is correct? It seems to me correct but 401 means it can’t find the server url. Basado en una plataforma web, consume muy pocos recursos. Viene con una API por defecto, la cual puede ser reemplazada por otra, y solo hay que poner ciudad,país. Rápidamente configurable desde la interface web, con soporte desde la pagina web del proyecto y podes dejarnos tus comentarios. Se basa en instalar un servidor local AppServ 2.5.10 que a través unos pocos archivos se obtienen los datos del tiempo obtenidos desde openweathermap org de forma totalmente gratuita. La versión Meteo V.1.0.2 de Radit ha quedado obsoleta y necesita una actualización. Es un software LIBRE. con código abierto. Derivado que las donaciones no son lo suficientes para continuar con un excelente proyecto de software libre. I finally managed to parse the visibility value. Next stop -> precipitation values. i’m working on a weather based android app and have an query that “how to modify the api URL according to the request of user” i.e in general we set the name of the city statically in URL whose weather we want to see but how to set the name of the city dynamically according to the user requirement ?